Discussion in 'General Discussion' started by ghostrider, Oct 13, 2006. As the world grapples with how to rein in the "axis of evil" state which this week conducted a nuclear test, this spectacular satellite photo unveiled yesterday by US Defence Secretary Donald Rumsfeld shows in stark detail the haves and have-nots of the Korean peninsula. The regime in the north is so short of electricity that the whole country is switched off at 9 p.m. - apart from the capital of Pyongyang where dictator Kim Jong-il and his cohorts live in relative luxury. But even there, lighting is drastically reduced. 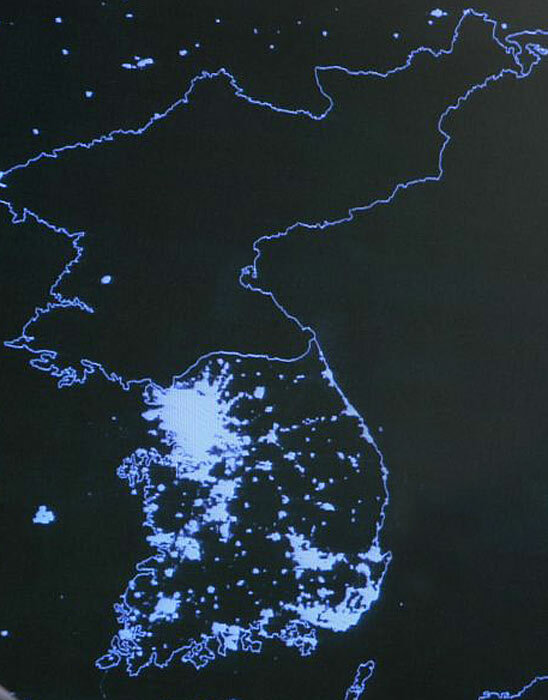 The result, as shown in this picture taken one night earlier this week, is a startling contrast between the blacked-out north and the south, which is ablaze with light, particularly around major cities and the capital, Seoul, in the north-west of the country. "Except for my wife and family, that is my favourite photo," said Mr Rumsfeld. "The people in the north are starving, their growth is stunted. It's a shame, a tragedy." An aide added: "This oppressive regime is too busy trying to make war to make life comfortable for its people." One cruise missle on the one dot will end all troubles. They don't allow cell phones either and take them away from visitors. Colonel David Hunt said "There's not a living cat or dog in N. Korea - that's how bad the people are starving." Imagine what one far-sighted General with brass cojones in the NK Army could do . . . Oust the Little man With Bad Hair, smooth over relations with China, give up the Nukes, bring light and food back to the people. He'd be as popular to them as a Rock Star here. One man . . . Except that from what I have seen it is like the novel 1984 and that one man is Big Brother. He has them all convinced that all good comes from him and all evil is due to those that oppose him. They worship him nearly as a god so if someone were to take him out they would most likely be killed by the masses they wanted to help and that one man would be replaced by his chosen sucessor or at least one in his own form.